You and your family rely on your bathrooms each and every day to get ready in the morning. These rooms are integral to how you and your family use and enjoy your property. By customizing your bathrooms to your unique needs during a remodeling project, you can vastly improve the comfort that your family experiences on a daily basis. At Allpro Contracting, our Southwest Chicago bathroom remodeling contractors would be honored to assist you with the effort. When you hire our professionals for your bathroom remodeling project, you are making the absolute best choice for the task. We have over 60 years of experience serving the Southwest Chicago community. Throughout this entire time period, our goal has always remained the same. 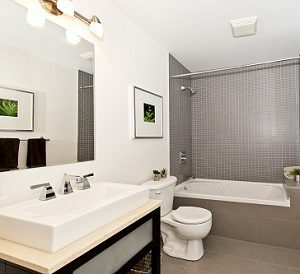 We strive to provide the highest quality and must customized bathroom renovation services to all of our customers. Call Allpro Contracting today if you are planning to invest in bathroom remodeling in Southwest Chicago. Our polite and professional staff would be happy to take your call and to answer any questions that you may have about the effort. We can schedule your consultation today. The centerpiece of any bathroom is the vanity. This is the first thing that you notice when you enter the room, and it is the primary work space of the area. Our Southwest Chicago remodeling contractors can help you redesign your bathroom vanity so that it is customized to your exact needs. With our help, you can install new cabinetry, countertops, mirrors, lighting, plumbing fixtures, and more. For small bathrooms, our professionals can limit the footprint of your vanity, giving the area an larger and more expansive feel. No matter what your goals are, our highly skilled professionals can help you achieve them. You and your family are guaranteed to be pleased with the amazing results. One way to dramatically change the way in which you use and enjoy your bathroom is by installing new flooring in the area. Bathroom tiles are very popular and very versatile. They come in countless colors, shapes, styles, and finishes. These tiles can be laid out in a pattern that is truly unique to your property. Our Soutwest Chicago bathroom remodeling contractors work with a wide range of flooring material options. From laminate flooring to hardwood, our team can help you select a beautiful and functional material that will stand up to the tough conditions of the bathroom. As always, we will work our hardest to achieve your complete and total satisfaction. If you would like an estimate for bathroom remodeling in Southwest Chicago, please call 708-658-3500 or complete our online request form.